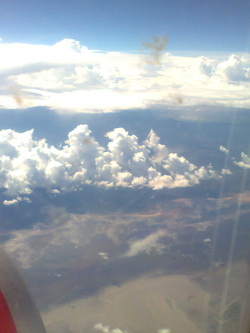 As I was on my way to Kenya in March 2011, I was siting at the window seat of the aeoplane, I was so fascinated by the beautiful clouds that I took out my cell phone and took a few photo's, so when i looked at the photo's on my cell phone, I thought why is my scrren so dirty, then I cleaned my phone, but the marks remained. I put the phone ack into my bag and enjoy the flight further to Kenya. When I got home after completing my mission trip, our son loaded my photot's onto the laptop, and as I was on my way to take off the washing, Holy Spirit said, turn around and go look at the photo's. 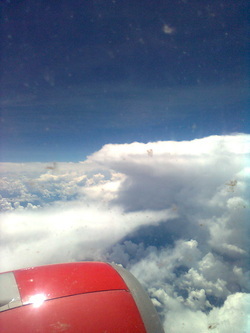 To my amazement, there I saw images on the clouds. The 1st image looks like (our son said, mommy that is Jesus coming as) the Bridegroom for His Bride. The 2nd image; looks like Jesus sitting on the cloud with a crown on His head and open scroll in His hand and He is looking into the scroll. The 3rd image looks like an angel throwing fire to earth. The Second photo: Looks like a Lion and a Lamb in one, lying on the clouds and an angel running on top the clouds throwing fire. Because I was flying over Africa, I know God has a great plan with Africa and God is going to use Africa as the light that will draw all men unto Him. Africa is a powerfull tool in the hand of God in this end time season. So Africa, Arise and Shine for your Light has come and the Glory of the Lord has risen upon you. The once rejected nation will become the corner stone. Africa (Egypt) has been a safe haven for Baby Jesus and for Moses, the Redeemers and today Jesus will be a safe haven for Africa. Africa will be the nation God will use to rose that Jealousy in Israel to return accept YESHUA as their Redeemer. These two nations Israel and Africa are vital in the plans of GOD in this time. The message YAHWEH gave me concerning these images on the clouds is; tell My people and the world they must get ready, I'm on My way! In June 2011 I left for Tanzania, after GOD spoke to me in my sleep, saying; go help in Tanzania. As a house executive and missionary, I said "Lord I say yes, so provide." So GOD provided. Before I left I received an email from Pastor Peter, asking me to pray for him as he is leaving for Tanzania to do revival meetings. I knew that this is the confirmation I needed. I replied on his email, saying I am on my way to Tanzania. So Pastor Peter asked me if can please come and minister with him, even if it’s just for one day. I left for Tanzania and met up with Pastor Peter Ndungu and some other church leaders of the church that will host us. Pastor Peter asked me whether I could minister for the first five days and then he will continue when I left, because I had to be back home for our son that was leaving for Namibia. During these meetings, I couldn’t minister as the presence of God was so present in the church. When I took the microphone, deep intercession with tears or prophetic song or prophetic dance overwhelmed me as the Spirit of God led me. During these meetings orbs like shinny bubbles, small and big would appear during these meetings everywhere in the church. These are some of the photos taken during the revival meetings in Tanzania. In November 2010 my heart was touched by our television news broadcast of people dying of starvation in Kenya. As I was watching this with my family, I said, Lord, I can't see and do nothing. Please send me there? They are my responsibiblty, because I am an ambassador of Heaven on earth. I had no finances at that moment to leave for Kenya. I started to thank God for His provision to get me to Kenya. By faith I made contact with a Pastor in Kenya to arrange my visits to these camps. Soon after that God provided and I left for Kenya. I live totally by faith trusting God for all my provisions when He sends me. He had never let me down, He is a faithfull God. This was a follow-up mission. Providing blankets and mattresses to orphanages and seeing God's word that He released through me, His bond-servant and daughter, to the people He send me to fed. God said He will give them back their lands and houses before January 2011. God turned the heart of President Mwai Kibaki without him knowing he is coming in alignment with the word God has released to these people. The president said in his speach that this trbe will receive land and homes before January. I saw with my own eyes God's word manifested in Kenya. Thank you Lord God Almighty.